Phreesia’s automated patient intake platform provides an individualized experience designed to engage patients in their care and give you the capacity to do more of what matters in your organization. We know that every patient who walks through your door is unique—and so are the needs of your organization. Whether you're a single specialty practice or large health system, Phreesia allows you to transform the patient experience, enhance clinical care, optimize staffing and increase profitability. Don’t see your specialty? Contact us! Create a custom Phreesia solution that engages patients in their care and gives you the capacity to do more of what matters to your organization. Whether you're a single-specialty practice or a large health system, Phreesia's automated registration tools provide a modern, high-quality experience while streamlining the patient intake process for your organization. 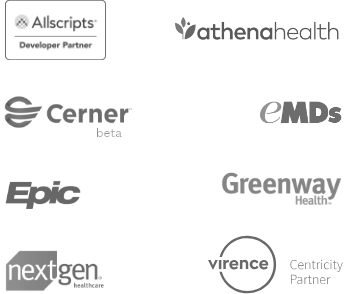 We integrate with the nation’s leading EMR/PM systems to support your healthcare organization.